What is life without Korean food? If someone said to me, “You can’t create stories anymore!” My heart and mind would shrivel. If someone said, “You are forbidden from eating Korean food.” My body would become dust. Given this, it’s kind of sad to see my country phobic of cooking! 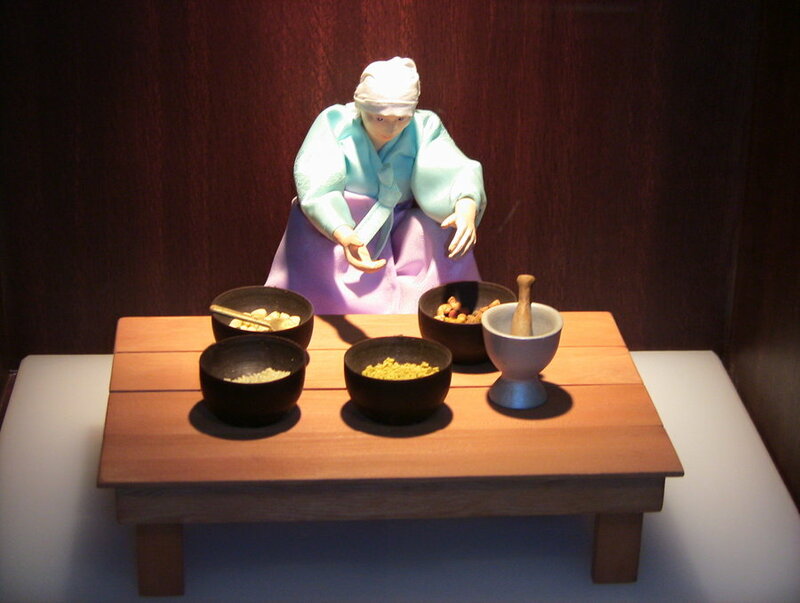 I had two grandmothers in my Korean family that cooked meals–fabulous meals. Food is culture and is Korea forgets how to cook its own food, we’ve truly lost something dear to us. How come China is making Kimchi? And do people remember Kimchi from the pottery jars without plastic liners that taste an awful lot like plastic? Cooking makes you remember. For me, who forgot and regained, this is special and shouldn’t be taken for granted. Food feeds your body, your mind your environment, your soul, your spirit. How can you seriously forget and leave it to other people? And so I bring you this simplified version of Jap Chae, because TV shows keep going on and on about how hard it all is–which is crock. It’s just that people have forgotten how to make it properly. Mandolin. Chops Vegetables. BETTER than a food processor–believe me. I’ve tried both. 1 pot, sieve, 1 large container (or serving dish) and something to stir with. Beef stock– low salt, low fat. I’m an advocate of salt and fat, but I’m an advocate of knowing when to add it and adding it yourself, not letting others add it for you. No beef stock? Water will do. Shitake mushrooms dried. OK. You don’t like them. Fine. You can add them to the stock, but not eat them. They give a very nice earthy flavor which can substitute the above if you so wish with some soysauce. Carrots–Asian style are best because they are HUGE and they grate nicely on the Madeline. Try to get strips of them. Leave behind at least a cup or so. A few can go to your mouth. You must feed the chef. Spinach- That bunch you get in the super market–you only need a handful of it. Make sure to wash it well! Eating Jap Chae with sand is nasty. Uhh… call that personal experience. Ginger Fresh. MUST BE FRESH! I’m a ginger addict. I don’t mind putting in a half a cup of it, but most people can only tolerate a tablespoon of it. (Wimps.) A little of it will help the flavor. Garlic–as much as you want! In the pan it’ll become mild. I’ve been known to put the whole head in… But people are not so keen can put in something like 3-5 cloves. Sweet Potato Starch noodles. (You can buy these online from Koamart) 1 package, you only need say half of that? Other veggies. I hate onions in this. The tooth feel doesn’t do well. Generally things that are soft when cooked do well in Jap Chae. Not corn, and not broccoli (if you cook your broccoli until its soft, you seriously have issues). Peas are alright as long as you are aware they aren’t supposed to be olive and hallow and have that weird dried-on sheen like someone poured oil over them. ELEW. Tips for peeling ginger: When you chose your ginger, it was firm, wasn’t it? It didn’t have a thick peel, did it? Peel your ginger with a spoon. Scrape the surface. Garlic Peeling Take a hammer and smash it (put something between the hammer and garlic. Garlic tasting like metal/motor oil is nasty. Peel is off, your frustration is out, you are done. Alright, bring your beef stock to a boil. You may pad it by adding 1 cup of water if you are short. Once it comes to a boil, turn the heat off. Put in the mushrooms first, the carrots second, any harder vegetables like Bok Choi, and any other veggies. Do not put in leafie greens like spinach. I guarantee they will overcook. Press down the noodles. They will inflate without heat. Don’t sweat it. Once the noddles are soft, but not cooked, strain the whole thing to the large container. Take out the mushrooms and chop them. I eat the stems, but some people don’t like them. Do whatever suits your tongue. You can add the whole thing back into the container after you’re done with the mushrooms. Cook the meat/heat it up. You don’t need additional sesame oil for the pan to cook the meat. Once it’s mostly cooked (not all the way… you still have some simmering to do), transfer the contents of the bowl back into the pot. Now you can add the spinach. Add soysauce and fresh sesame oil to taste. Add garlic and ginger. Keep the heat to low! Over time the noodles will start to absorb most of the stock. You want this to happen. The sound will change to over time from a boiling to a sizzle. Cut it off before it sizzles. Keep some of the broth. Also keep a constant eye on it. Though you may not know it, it could burn on the bottom. That is not fun to clean up. Once done, you can transfer it back into the serving plate. The serving plate didn’t have the uncooked meat, so it should be fine. See… people usually make it the much harder way. They use knife work instead of a mandolin. They try to cook the veggies separately, generating 3-4 pots. They cook the noodles separately. This way is easy and it gets richer flavors in the noodles as they absorb the flavor of the stock and the mushrooms. My way has one strainer, one pot and one container to clean. And it’s easy… even my Korean friend commented that I made it look easy. In every Korean market there are vendors, usually in the middle of the street or at the side of the street selling wares. Unlike American markets, and Chinese markets, they aren’t districted to one particular area. 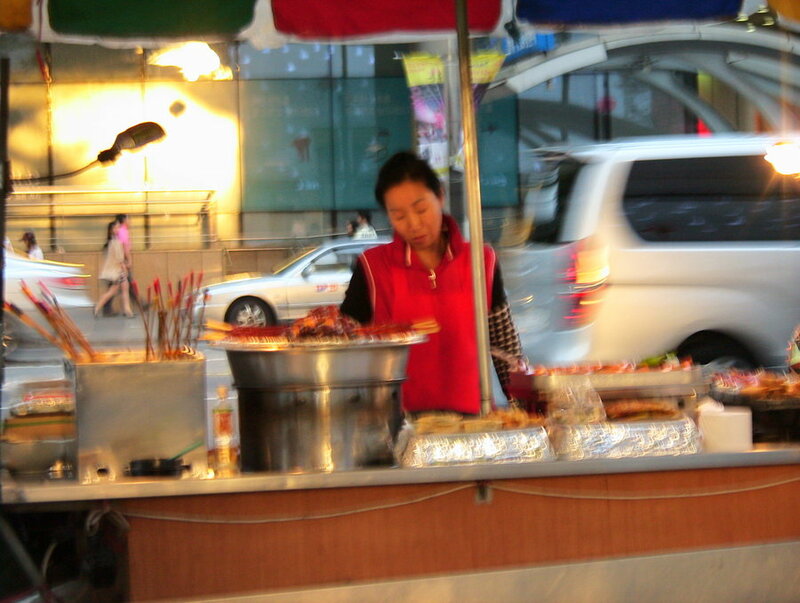 The foot from street vendors are very cheap and usually various foods are seasonal. 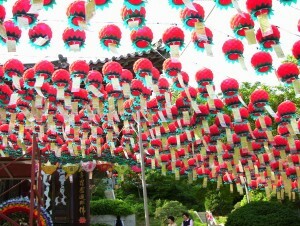 For example, you can get more Odeng in the winter months rather than in the spring. 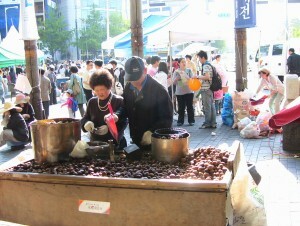 This one is selling chestnuts, which they give to you in paper bags and are piping hot. 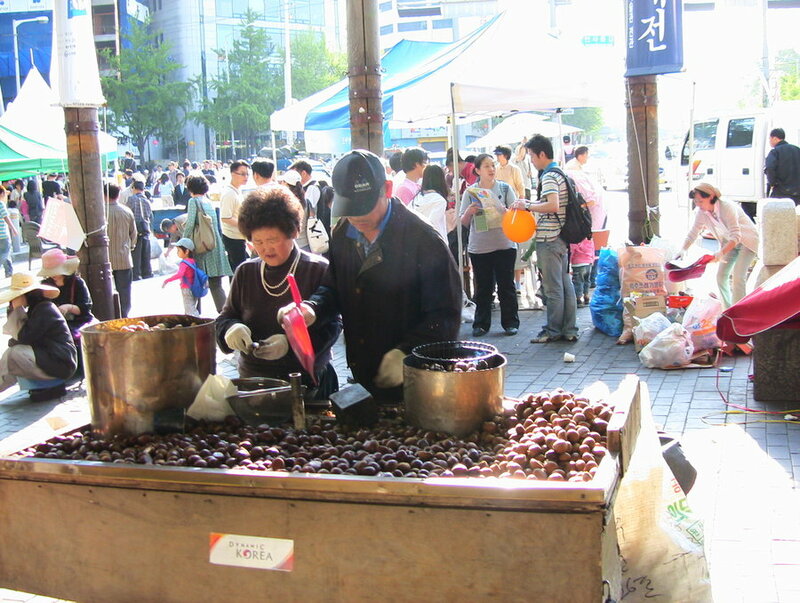 Technically, most of these stands are illegal, but the Korean government overlooks these vendors, and it’s become integrated into the culture. I wanted some of her wares but my Mom whined and said no and started to move off without me. Since I had friends who were curious, I took this shot for them. If Ajumma is still there next time, I’d have her wares. One Odeng and one serving of Deok please! It has a very sharp smell too. After the fight, my mom tried to make it up to me in her nervous energy way. Our relationship had always been contentious. Not because of the adoption so much, but the fact that she used me for her stress relief–emotional stress relief. I resented this even more, because I was afraid she was going to try to Honeymoon phase me and then things would get worse like they had in my ex-boyfriend. I recognized that his behavior and her behavior were often the same. So when we climbed into the car, I knew Ajumma could sense the tension in the air. I was not happy. 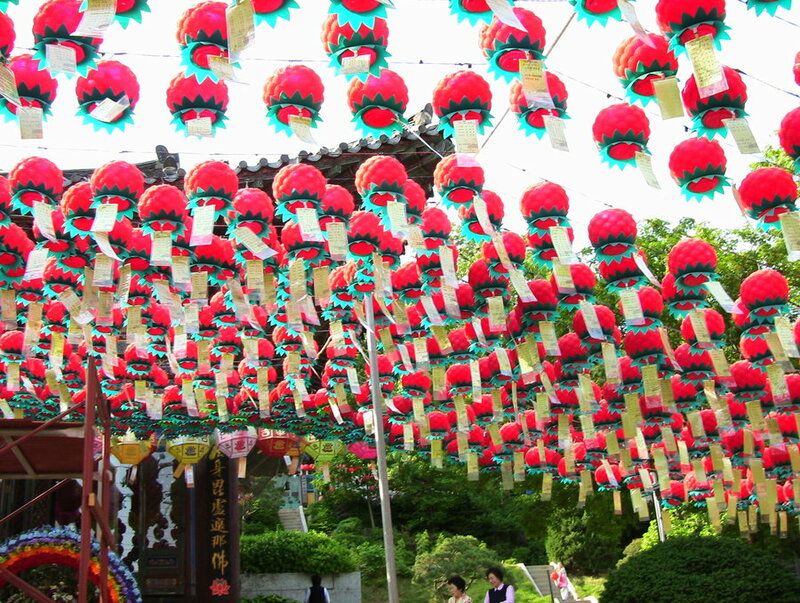 We tried to go to Seoul Tower. 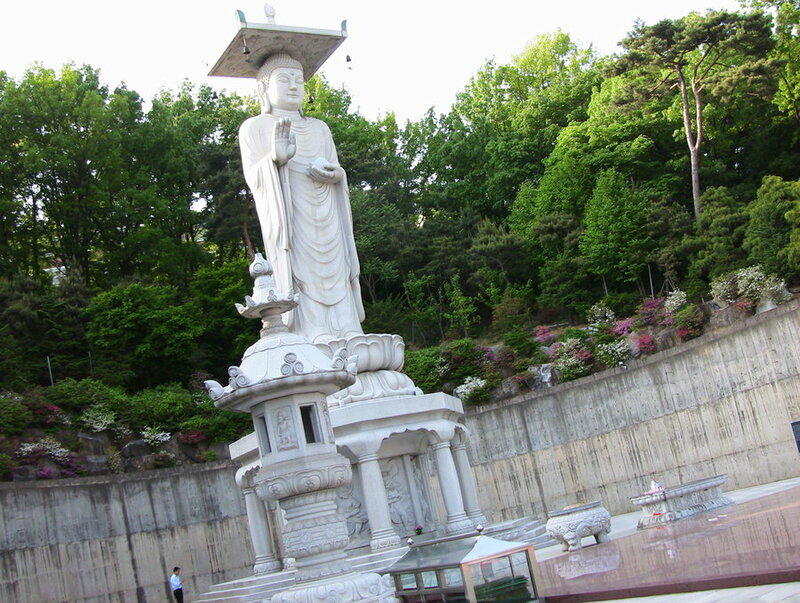 We couldn’t because of the ajussi who said that we couldn’t go up ’cause only buses could go up, so Ajumma took us to the Kimchi Museum. Ajumma was interested ’cause she didn’t know it existed. No Koreans seem to know it exists, which I think is weird because its in the COex building, which is well known among Koreans. When I imagined a kimchi museum, I thought it would be more interactive. But then, maybe I was thinking of Kimchi Jang. I have to admit that I didn’t know that different climates had different kimchi pots. That interested me. And my dad was super interested in the pottery. My Mom was all nervous energy. Her voice warbled all over the place as if she could not calm down and she clinged to my Dad quite a bit. Maybe she had switched me to the evil side of her mask. When she didn’t know what to make of me–good or evil she often distanced herself. I was still upset and sorely disappointed that the Kimchi museum didn’t have proper kimchi nor anything about the varieties of Kimchi. I love my kimchi (which is why I feel bad for my brother that can’t eat spicy food anymore.) So I wanted more out of the museum. One thing I should note is that Korean museums are really cool because they put a lot of effort into helping you see how the buildings and things were used and made. So the Kimchi museum showed how a Kimchi jang would work. There were also displays of various people in all of the museums and you literally could see mannequins wearing real clothes inside. I’d watched enough Korean dramas to fill in some of the dialogue for them as well. But that may be my writing side talking. With the above picture I could hear her saying, “Kee~ you put in too much garlic.” Then the other women arguing over it as she argued that proper kimchi has ginger too, and the other women arguing with her that this was entirely improper. I think imagining this made my anger go down. Because I can’t be angry at kimchi. Because kimchi and my love of it was often the only thing I knew was entirely Korean and no one could call me inauthentic for.